The head of the University of Illinois Foundation announced this morning he will step down as president at the end of the year. 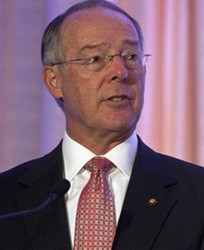 Sidney Micek, president and CEO of the foundation, the private fundraising arm of the university, plans to work on a part-time basis on special projects for the organization. "I believe this is the right time for me to step down as head of the foundation for both professional and personal reasons," Micek said. "It has been a privilege and honor to lead the foundation and to serve this great university." Micek has been at the helm of the organization during the UI's Brilliant Futures fundraising campaign, the school's largest. As of Nov. 30, 2011, $2.327 billion was raised, surpassing the goal of $2.25 billion.